The Hale House is a historical house near Cabin Creek, West Virginia. Although the house is full of history, it is now a quaint little Quilt Shop. The owner was kind enough to let us snap some pictures, and give us some history on the place. The legend of the house is that a woman lived there with her abusive husband and his uncle. One night, someone killed the husband. There was an investigation, but no one was ever convicted for the crime. 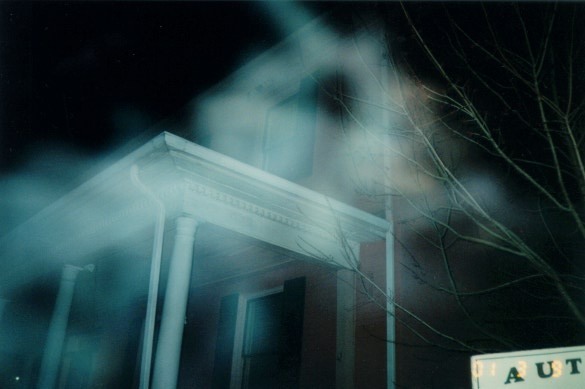 We snapped several shots of the place one night, and 2 of them had this ectoplasm type image which seemed to cover the house. We were allowed to go into the house, and snap a few pics.. which I'll post as soon as they are developed. A complete scan of all rooms with an EMF Meter, showed no Electromagnetic Energy. The readings and inside shots were taken several weeks after the outside shots.. Keep checking back for the new pics! Thanks to the owner and the lady who helps him run the place.. they were extremely helpful and friendly to us. If you're ever near there, stop in and see the house. They have a small West Virginia Books Section.. which oddly enough, contains "True West Virginia Ghost Tales!" Bruce Chapel in Gallopolis Ferry, WV. 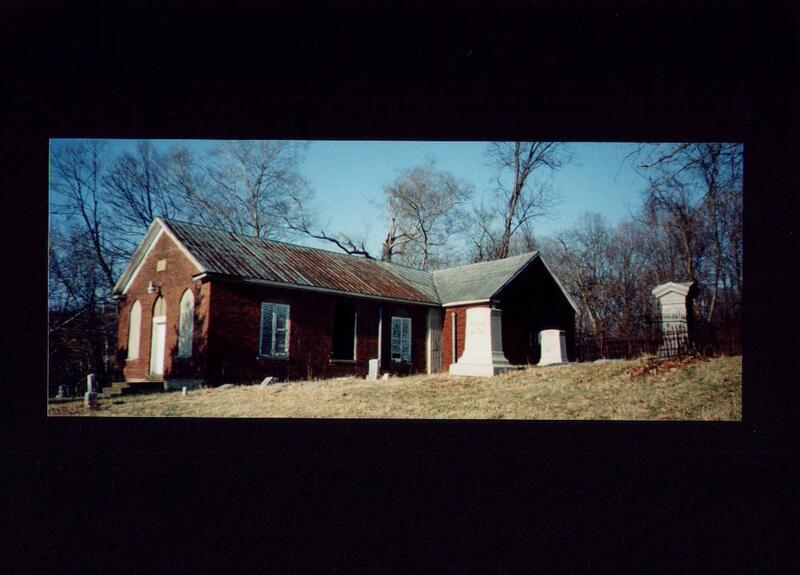 Bruce Chapel is an abandoned church in Gallopolis Ferry, West Virginia. Gallopolis Ferry is about 10 miles from Point Pleasant. The local people told us about a lot of strange occurrances at the old church.. so we took our cameras and instruments to investigate! E-mail us through this web site! Let us check it out.. for FREE! We have team members who specialize in everything from Photography to Research.. we even have a genuine Psychic on our team! WE DO NOT GET RID OF GHOSTS! We leave that to the movies. We simply do the history and research, take photographs, and offer an explanation for what is happening through various proven methods. We scour the entire state of West Virginia, as well as Eastern Kentucky, Northern Virginia, and Southern Ohio for paranormal activity. We've seen it all.. what can you show us? We are a group of 5 members, who, strictly a hobby, investigate reports of Hauntings and Paranormal activity in and around the state of West Virginia. I guess you could call us "Weekend Warriors," because most of our team's investigations happen on the weekends. We do all have day jobs. (There isn't a lot of money to be made looking for ghosts!) Our methods of investigation include History & Research, different types of photography, measurements of Electro-magnetic fields, and audio sampling. We are not professionals.. but we are free. So little is actually known about ghosts and hauntings.. we really can't say that anyone is a professional in this area. For us, it's an outlet.. ok.. maybe an obsession. Hey, everybody has something, right? If you have a haunting that you would like to report to us, we'd love to hear from you. You can contact the following team members just by clicking on the name below. Any inquiries or information will be kept strictly confidential. Sign Our Guestbook/Tell us your story! Looking for more Paranormal stuff? Click here to go to Paraseek.com! It's The Only Paranormal Search Engine we use! Much Love to Katie Guy for her help on the pictures for this web site!